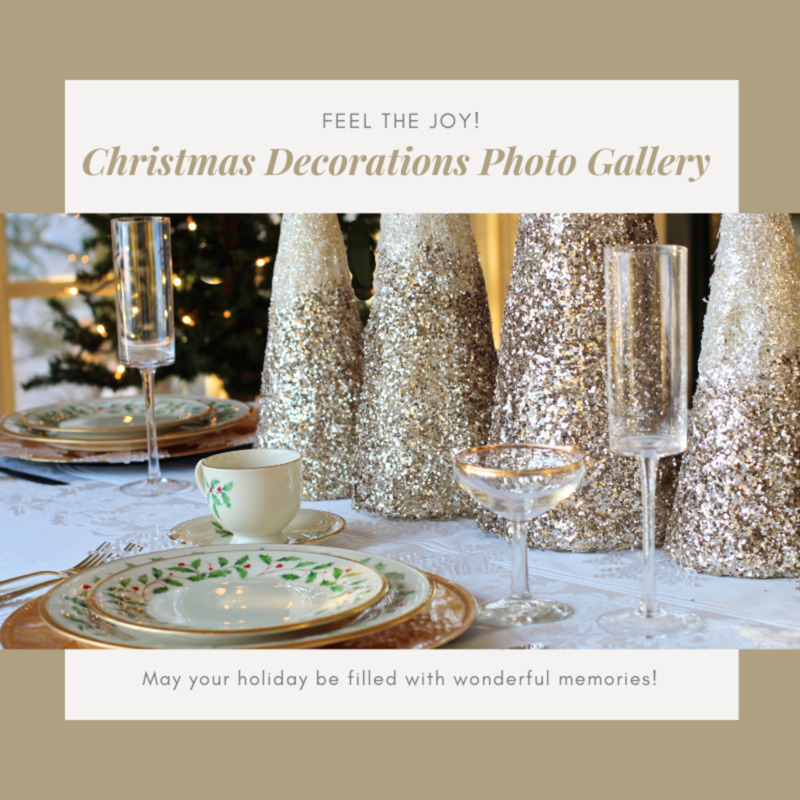 Christmas is coming and I am starting to decorate. 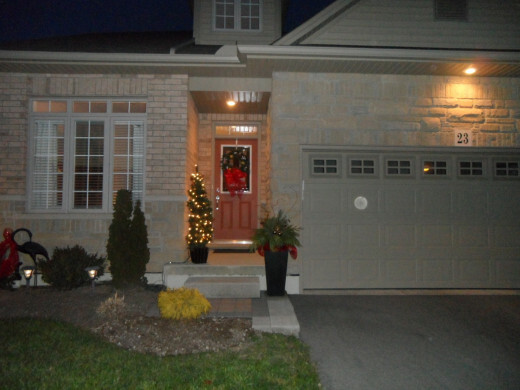 Well actually I started a couple of days ago, by first buying some greenery for my outside urn, putting my wreath on the front door, an artificial lit tree on the front porch and wrapping some lights around my now sleeping Limelight Hydrangea tree. 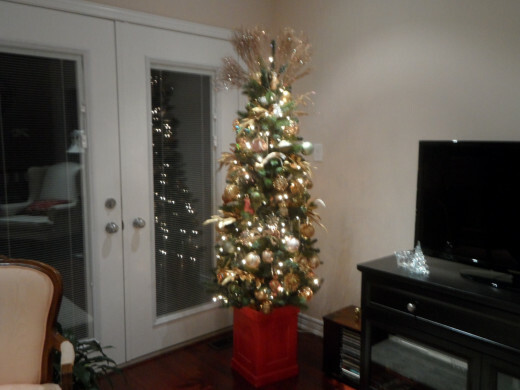 A couple of days ago I decorated my big tree - which is not very big - but is one that I can handle on my own. And last night I decorated my mantel. This afternoon I decided I better get a move on and get a few more things out as I have a potluck appetizer night here on December 6th for the Dr. Bob Kemp Hospice grief group - and that date will be here before I know it. Everything has changed in these last five years for my little family. In 2007 we lost my Aunt Mary. In 2010 we lost the love of my life, my husband Craig, Father to Peter and Paula, Father-in-law to Deb, Grandfather to Tarra and Kyle and a good friend to many. This will be the first year that my mother will not be coming home for Christmas. She is still alive, and in the Wellington Nursing Home, but she is no longer well enough to move around and my Aunt Ida, bless her soul is in the Wentworth Nursing Home -and will be celebrating her 99th birthday on December 8th. Having said all of this, I don't want this to be a "down" hub. That was not my intention. But it is because of these four people that I can celebrate Christmas in a "Happy Way". Putting out my decorations today I realized I could celebrate each of them and I wanted to share some of my joy and memories with all of you. 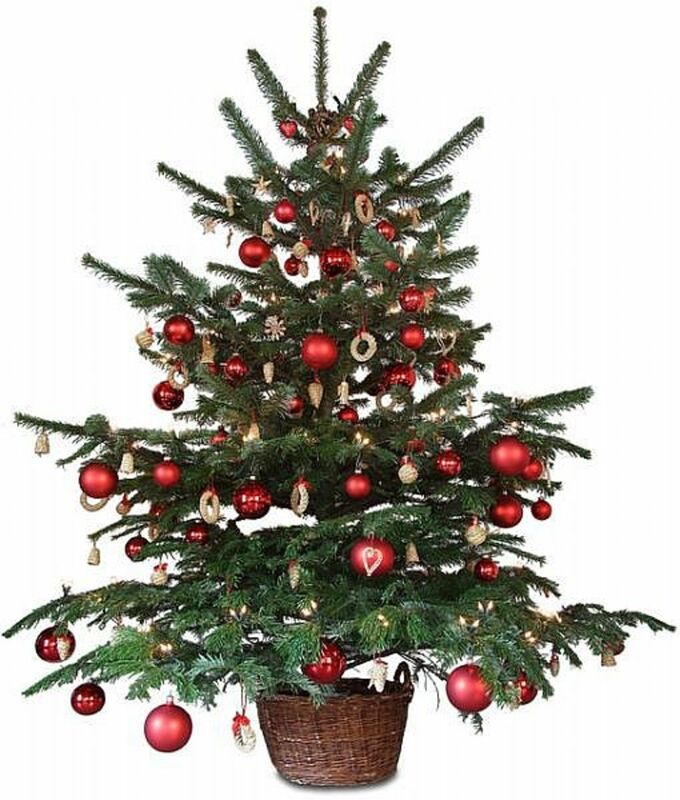 That first Christmas after Craig passed away I thought "I am not going to get a tree". We had sold our big tree the year before as we were in transit, with furniture in storage for six months before we could get into our new townhouse. 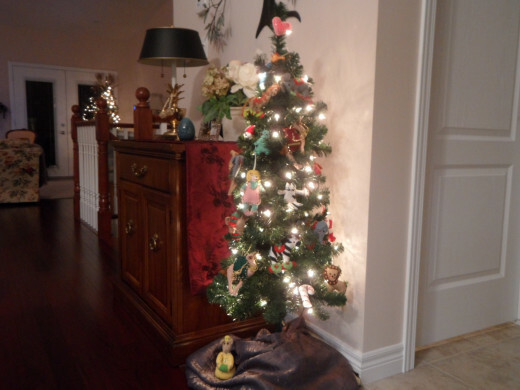 But my friend Barb insisted that I had to get a tree for myself - because "I mattered" in her words. So I went to HomeSense and bought myself a tree in a planter that would stand just a foot taller than me. I had to be careful because I have vaulted ceilings - but I was able to put it in the corner where the lowest part of the ceiling is. It worked. Then I thought "well since this is not a "big" tree - why not go out to Holland Gardens and get another tree just to sit somewhere else in my space - lit, but with no decorations. That worked too. And then I remembered that while in transit at our friends place I had bought a small lit tree to put in her front window, so I dragged that up from the basement and now I had another lit tree in the kitchen area. Voila I have sparkle and lights - if not a huge tree - I had lights! 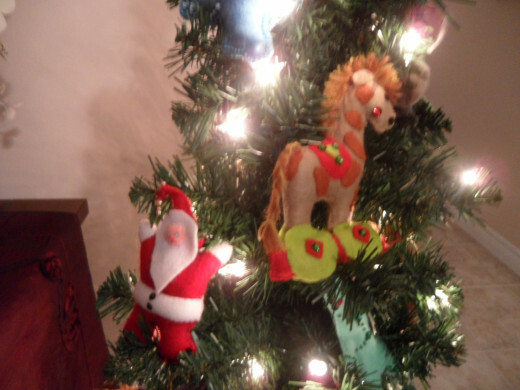 Last year I started decorating the small kitchen area tree with heirlooms that my Auntie Ida and Auntie Mary had made - little people and animals made out of felt, stuffed and with sequins and beads sewn onto them. I thought it looked so neat that I did it again this year. So as I walked around doing this today I got such a warm feeling thinking of these precious things and the people who had given them to me. My "Big Tree" has some special things on it. There is a carousel that my mother gave me years ago. 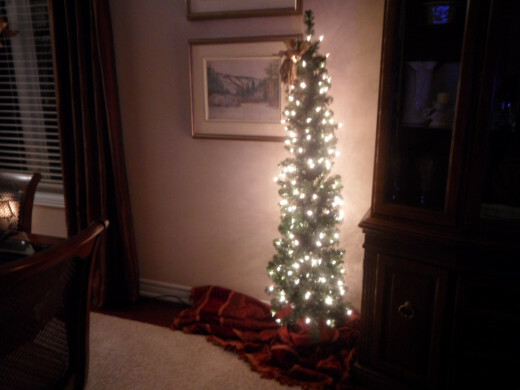 You were supposed to plug a light into it on the tree and it would twirl. 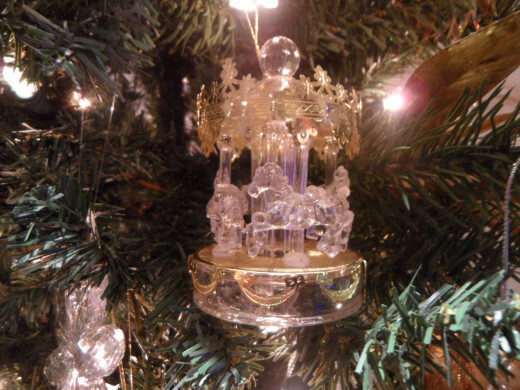 That has long since disappeared, but I still love the carousel for its sparkle and never miss putting it on my tree. The first Christmas without Craig I got a lovely surprise when I got a package in the mail from a niece-in-law that neither of us had met. Kandis married Craig's grand-nephew that summer and Craig and I were not able to attend the wedding because of Craig's illness. Kandis was out shopping with her mother one day and saw this little angel resting on a half moon and immediately thought of Craig, and sent it to me. I treasure it and it gets a spot near the top of the tree - this being the third year in a row. 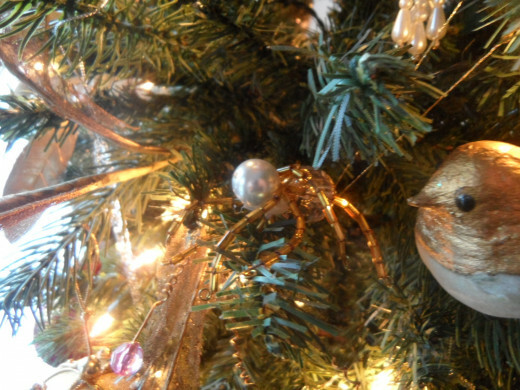 And then two Christmases ago my cousin Mary Ann asked me if I had a spider for my tree. What? No, I don't! She proceeded to tell me that this was supposed to be good luck and then presented me with a beautiful decoration - a spider with a pearl head and gold bugle beads strung for its legs. On the Kitchen tree is an assortment of little people and animals most of them made by my Aunt Ida. 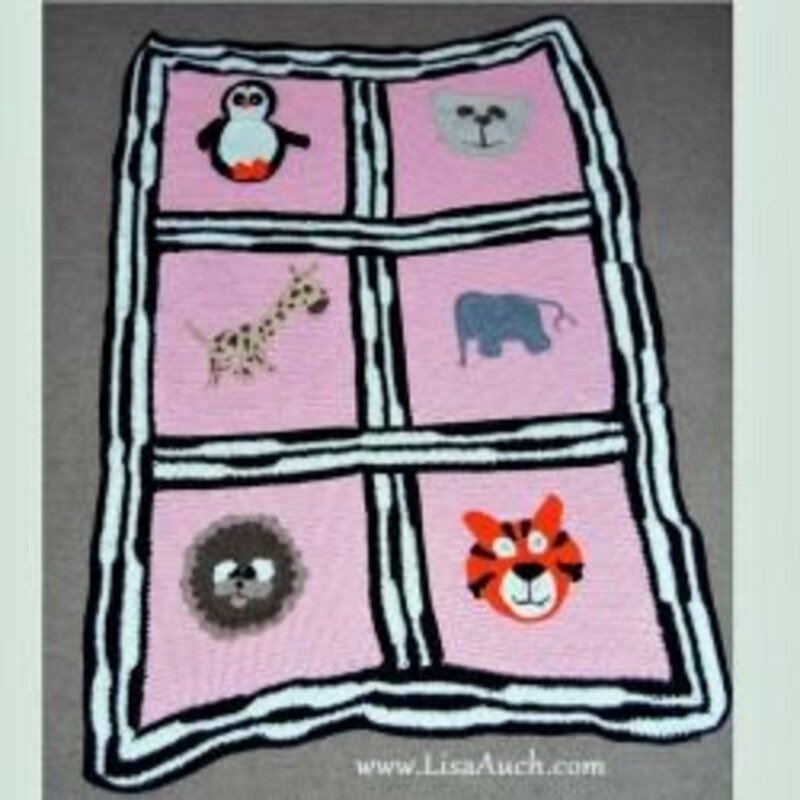 There are gingerbread people, Santas, elephants, zebras, lions, sheep, cats and even little hens. A heart adorns the top of this tree to remind me of all of my favourite people. 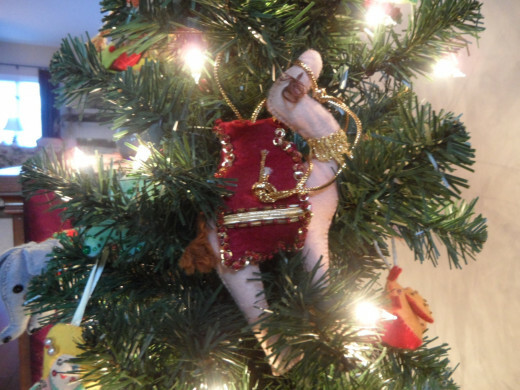 My Aunt Mary made some of the Santa Clauses and Miss Mouse that sits at the bottom of the tree. My mother made the camels that sit on the tree and while this tree is not big enough to hang the Wise Men on , I usually sit them on a table somewhere. 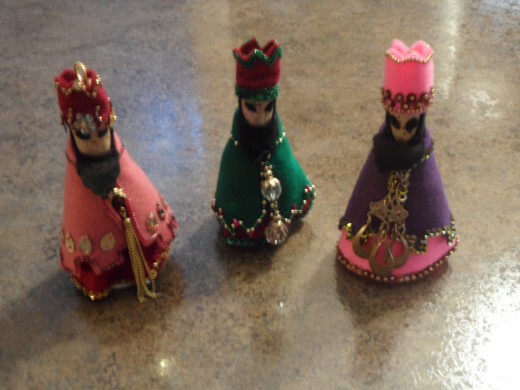 These Wise Men are made out of toilet paper rolls and then wrapped in colourfull felt, a wine cork serves as the head. The crowns are also made of felt and discarded bits of jewellry are used to adorn their robes. These treasures have been part of my family for a good number of years and I am so happy that I have saved them. 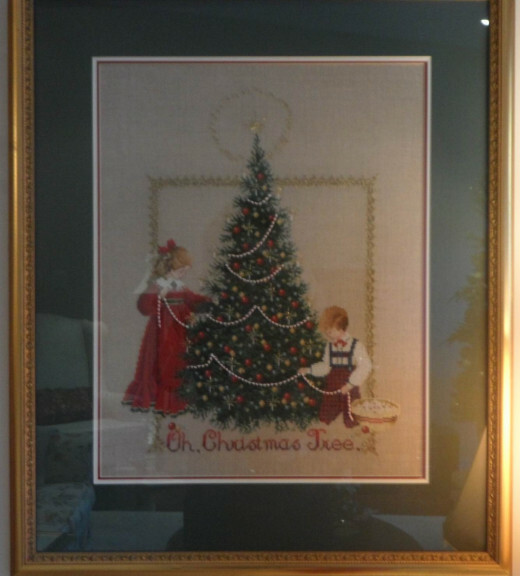 My mother also of course did the cross stitch for the "Oh Christmas Tree" framed picture. I wish you could see this in person. It is beautiful. 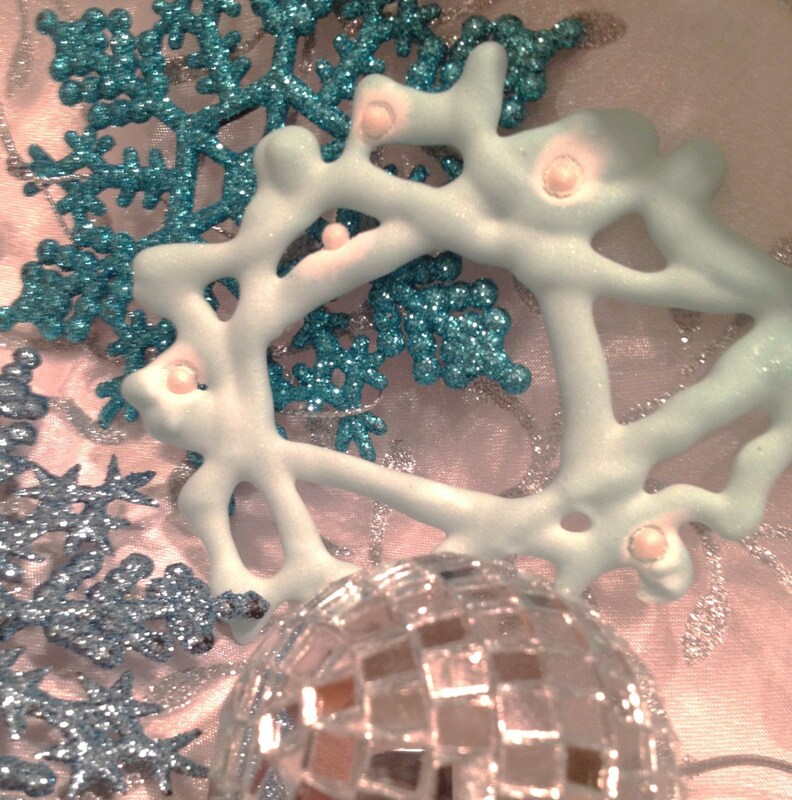 There are actual beads sewn into the tree as garland. 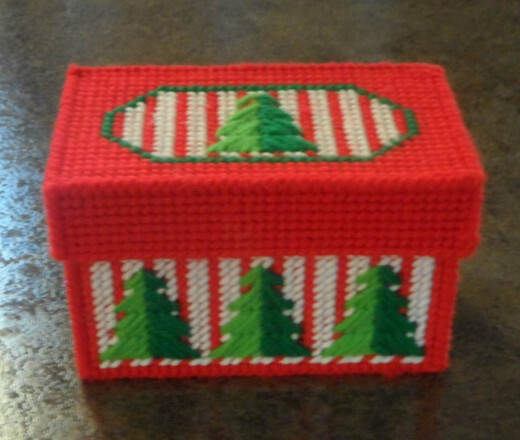 And the red box with the Christmas trees adorning it was also done by my mother. She was quite a baker, and every year throughout all of my growing up years she would give gifts of cookies at Christmas to neighbours and friends. This box is from one of those Christmases. 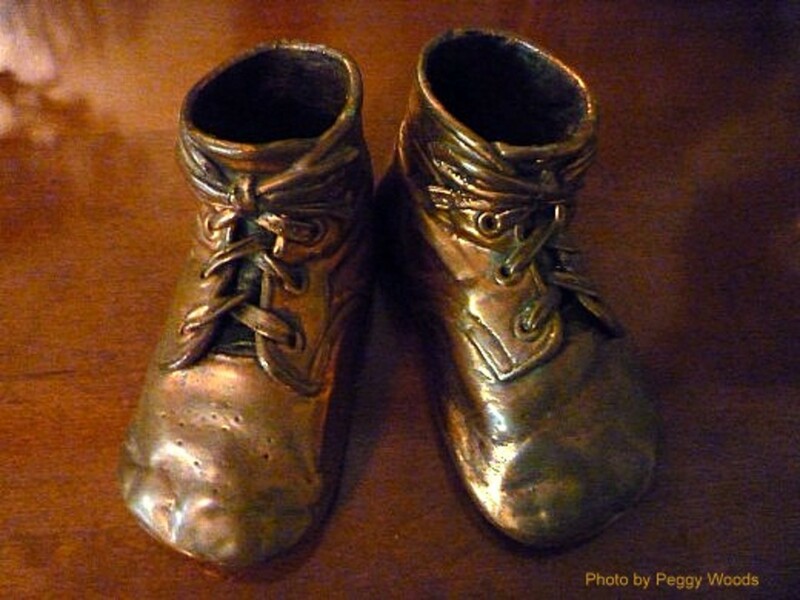 And in another hub I wrote about "Life's Little Treasurers" . 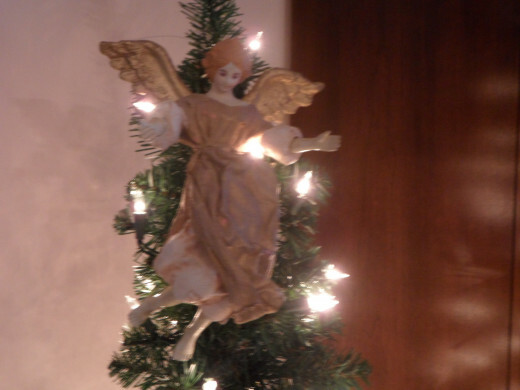 In that hub I mentioned the angel I rescued from her locker room when we were cleaning it out, getting mom ready for the move to the nursing home. 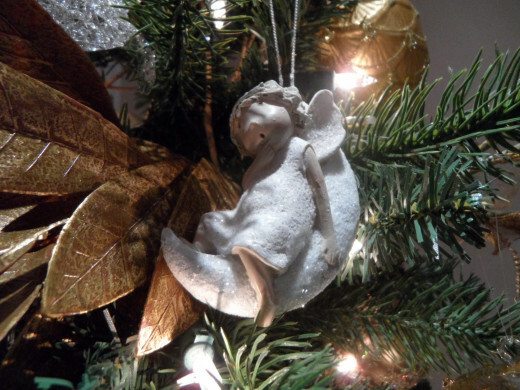 This angel now sits at the top of my lit, but undecorated dining room tree. My decorating is just about done - just a few more touches in the dining room, and kitchen area. But for all intents and purposes the important items are out and I cherish each and every one of them. I am in a good space now, and through this Christmas Season I will feel happy surrounded by these things that my family have contributed to my memories. They are priceless! It will be sad to have this "first Christmas" without my mom being able to attend, but of course we will be visiting her in the nursing home. It isn't the same, but still her essence will be present at home with all of these things she has given me. And that's a good thing - as Martha Stewart would say! One last thing. 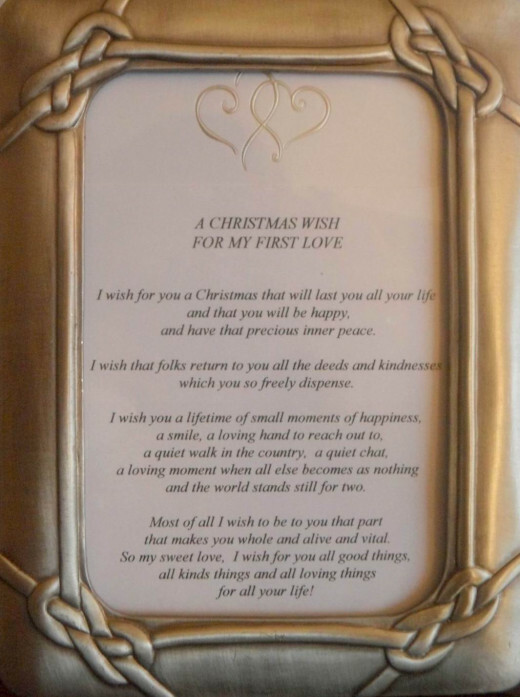 That first Christmas I thought to get out a note that Craig had written to me in our early years "A Christmas Wish". I put it in a frame and sat it on my table near the dining room, hoping that it would make me feel like Craig was with me. All the while he was saying in my ear "I am with you Lynnie" - and now of course I know that he is. 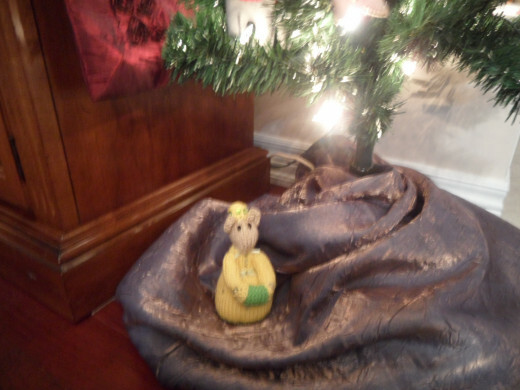 But I will still put it out every Christmas, because I love it and I treasure it. And I know in the end that no matter what happens, I am indeed a very lucky gal. I hope that I have been able to add a little bit of sparkle for you, my fellow hubbers, this Christmas Season. 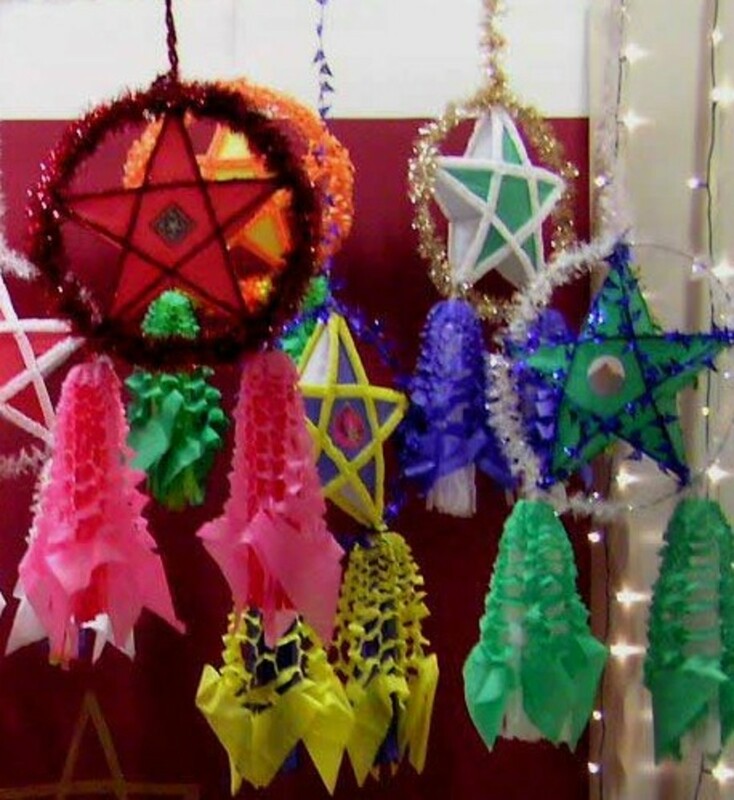 Peace and Happiness to all of you. Aw thank you so much peachpurple. Drop by any time : ) And thanks for the votes.